The Learning Spaces Theme within LEaD were behind the design principles that include the aim of providing spaces that encourage active based learning. 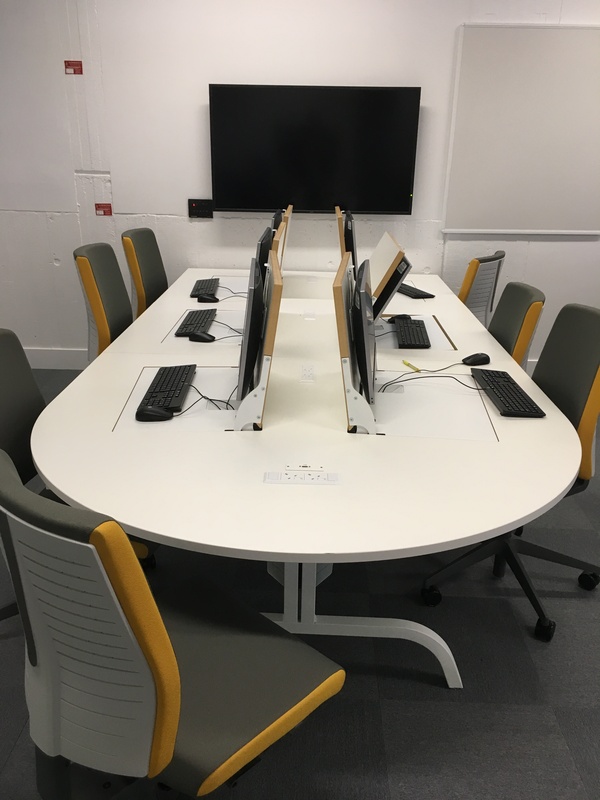 One key element is the layout that permits an effective environment for students to work in groups of six, each with a PC and one shared LCD screen, together with a local matrix to display each PC. 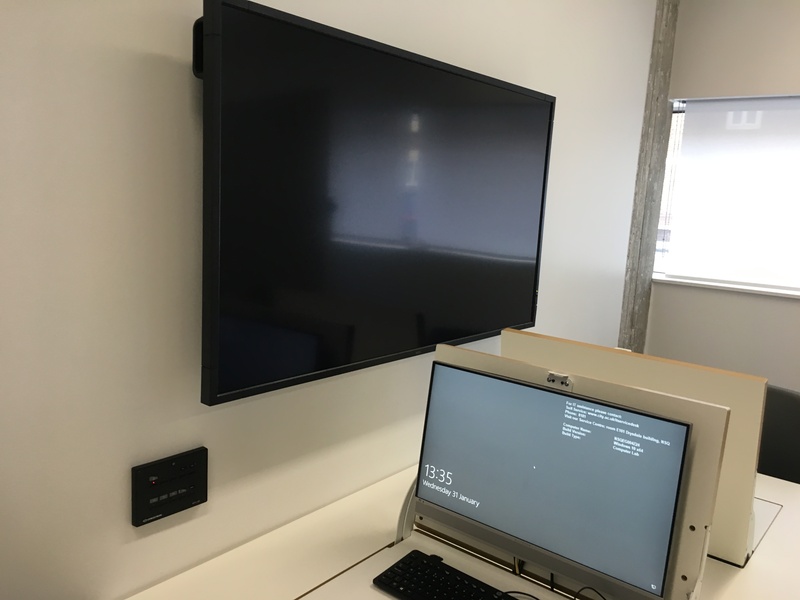 The academic can also select each group display to share on the large NEC projected display screen as well as switch the main presentation output to every group table. One feature I was keen to see implemented was the ‘D-end’ tables, instead of the rectangular shape typically drawn by planners. 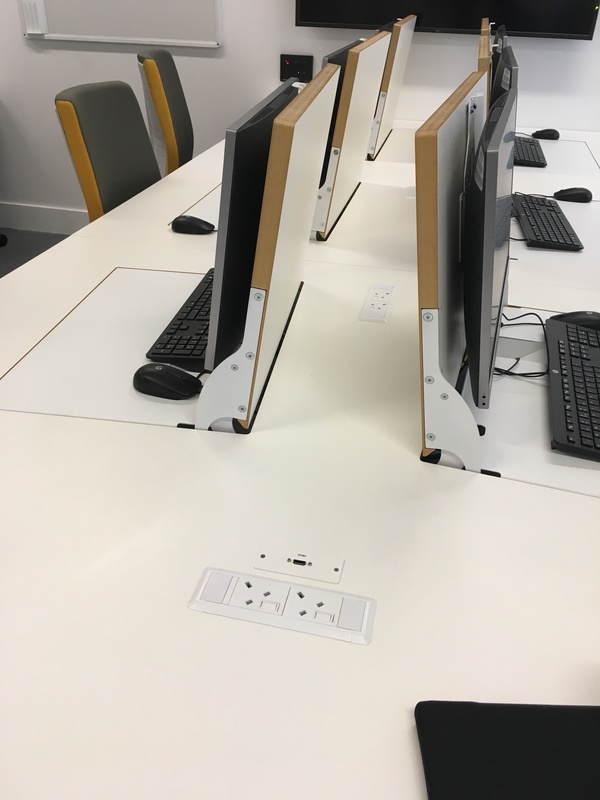 These large tables have integrated computers and monitors that can be retracted when not required. A key design benefit as the space is not restricted to being a traditional computer lab. This provides an opportunity for academics to deliver their curriculum in a more progressive way and include innovative teaching practices that may involve the use of the PC’s, or not! 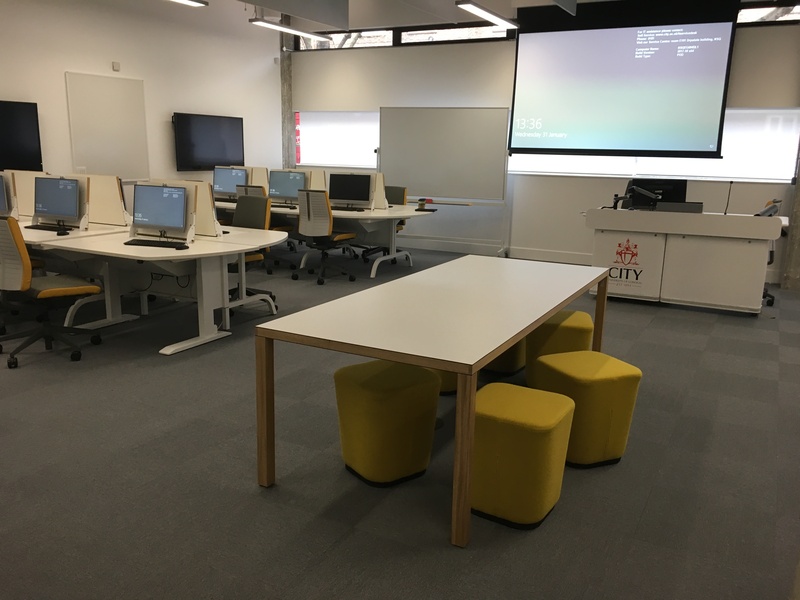 The University has been very positive in allowing space to be left for incidental or planned activities away from the desk. Again the Learning Spaces team within LEaD were instrumental behind a development in pushing for greater pedagogical opportunities, so there is a large table with soft cube stools for break out sessions or for one to one conversations away from the group tables. These curved end tables from Dalen Top Tec provide an ergonomic and approachable shape for staff and other students to participate within the group. 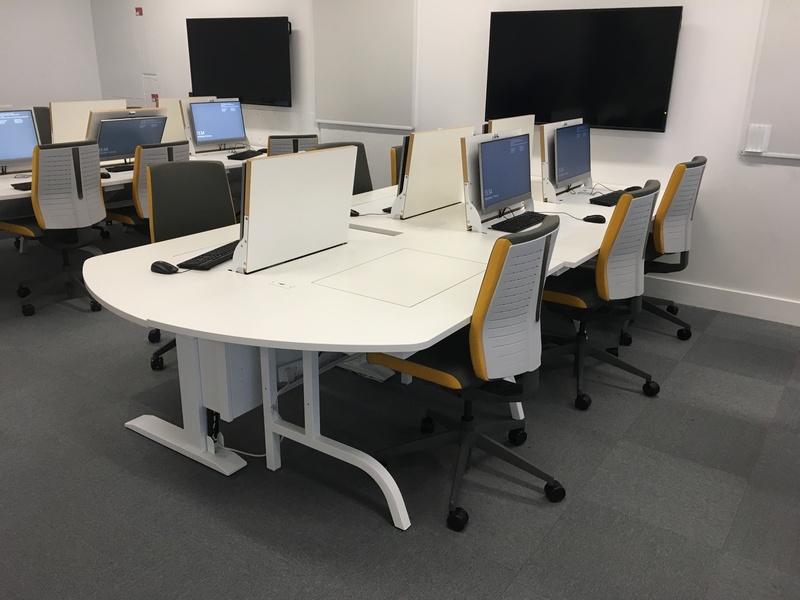 There are also DDA accessible tables, spare power and USB sockets, a height adjustable lectern and ergonomic task chairs for all. 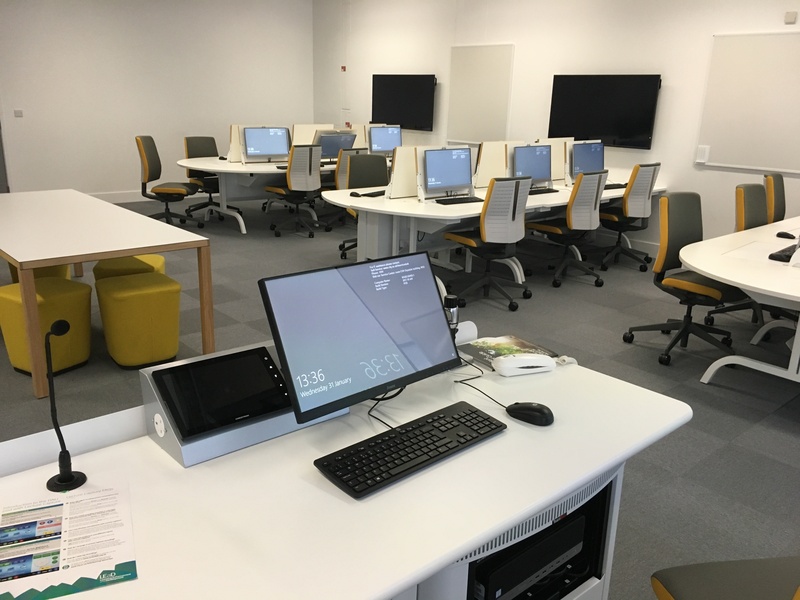 The space has been equipped with technology for lecture capture as well as the latest visualiser from Wolfvision for display of the main writing surface.